The day after 37 Oops, didn’t post yesterday. Nothing exciting to post on, it was more practice with system schema and FBDs and the last class finally did the spring force lab. 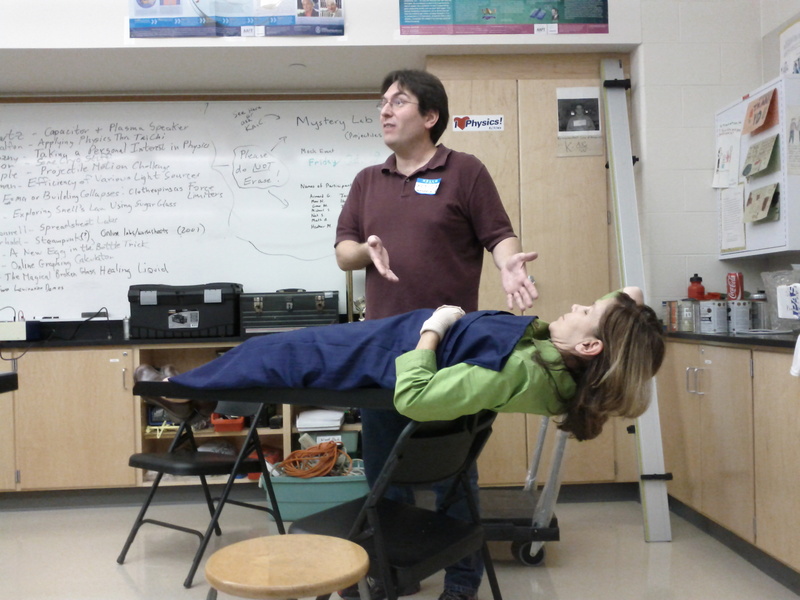 Today, Saturday, I spent a good chunk of my day at our local physics teacher group’s Demo Day. We are the Southeastern Pennsylvania Section of the American Association of Physics Teachers (SEPS AAPT), and every fall we get together and share cool stuff that we do. I showed off the Desmos online graphing calculator, because it is cool, and I demonstrated wave superposition using addition of sine functions. There was a wide variety of stuff, from a 3000 F capacitor (2.7 V max) to the index of refraction of “candy glass” to collecting liquid oxygen between two magnets with the help of liquid nitrogen. At the end, Ken Fink of Wondergy showed off his magic trick, framing it as a center-of-mass demonstration. The woman’s center of mass is over the chair, so she is supported by it. (It is even more dramatic when Ken takes the board out from under her.) A lot of teachers showed up, and a good time was had by all!